Interested in taking your child to Lil' Yogis but don't see any classes that work with your schedule? 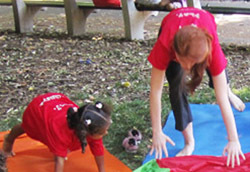 Lil' Yogis NYC offers yoga in the classroom for grades pre-K -12 in schools throughout New York City. We will also come to any Special Needs School to host a yoga class in the classroom or during the Physical Education period. How do I get yoga classes at my school? Copyright © 2017 Lil' Yogis NYC. All rights reserved.